"It was too good of an idea"
This addition to the deck, a new railing and walk, new set of steps, a pond and totally new landscape plantings was an eye-opener. For the homeowners it had come down to the large changes outside vs. the addition to the size of the kitchen. The drawings and estimate were put together for the kitchen and none of the possibilities excited the homeowners, whichever wall was to be removed presented an additional set of challenge and or problems. They turned to the outside and I was given a long list of idea’s, thoughts, wishes to consider. The plan was to achieve creating an outstanding outdoor space taking advantage of the property and surrounding views. 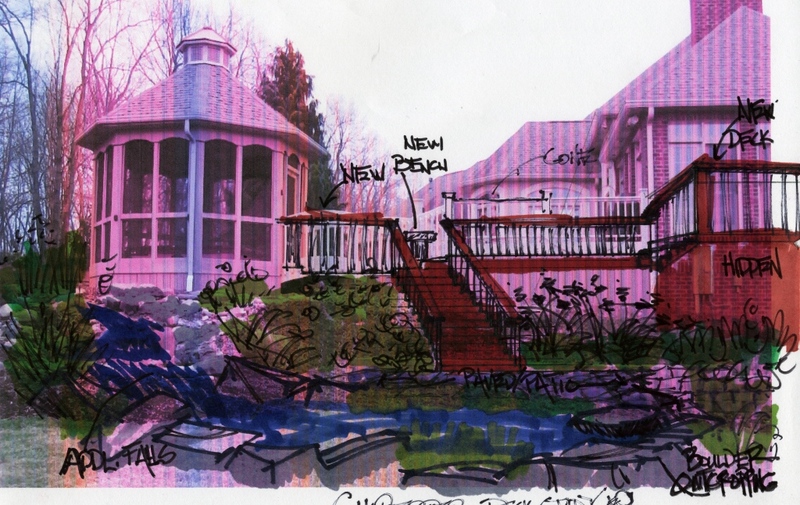 This included a strong desire to make the existing small pond “better”. A 6 x 6 pond had turned into a maintenance nightmare-too small to balance itself out. Anyway to make a long, long story very short. I came up with some final plans based of a series of concept drawings, the above included. I included a range of prices the area landscape contractors would come in at. Prices that I believed the 3 or 4 best guys would deliver a quality product. The homeowners thanked me for my time and honest evaluation of where the price would come in at. They decided “if” they were going to install this design-it would be done this way and nothing less was acceptable. I sensed some, for lack of a better term sadness by the homeowners. I had always gotten the impression they were unhappy with being unable to come up with a solution to the kitchen expansion, they really wanted the expansion. The outside could be installed and in late 2010 or 2011 they had hoped new addition. Because the kitchen could not be expanded satisfactorily, they decided not to go forward with the landscape, and at a opportune time in the future . . . . they are going to move. They want that big kitchen! Nice perspective. You must be practicing Perard. Your example is a good study of the “Client”. Getting behind the client’s words and outwardly expressed ideas is the key to understanding the the real project. We all have experienced this to one degree or another. Might make a good workshop topic. This would not be a “war stories” session but rather a deeper discussion of client motivation, desire, resources and fortitude.